High-performance KVM and remote management solutions are an invaluable part of any government agency’s arsenal. Beyond IT departments, these solutions are used in data centers, labs, control rooms, server rooms, situation rooms, and even out in the field. These reliable and secure technologies extend the reach, reliability, and speed of communications involving video, maps, radar, and sonar. Plus, they help to ensure that the infrastructure your department (and the nation) rely on is always operating at the highest level. 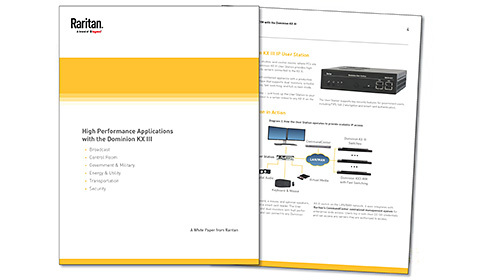 The KX III series of IP KVM switches feature a powerful next generation video processing engine. Unlike traditional KVMs, it seamlessly handles administrative tasks as well as dynamic video applications with ease and speed. The complementary IP User Station is capable of streaming two 1080p video sessions at 30 FPS. It supports eight or more simultaneous IP sessions, and a productive GUI across one or two monitors. It can sit on a desk, be mounted in a standard 19” rack, or VESA-mounted on the back of a monitor. Best of all, there's little to no maintenance when compared to a PC. Raritan Secure Switches (RSS) offer a proven desktop access solution for guarding against cyber intrusion for government and military agencies. The RSS is lab tested and certified to meet the requirements of the latest NIAP Protection Profile for Peripheral Sharing Devices version 3.0. There are four available models, two port and four port, with and without Common Access Card (CAC) authentication. The SX II series of Serial Console Servers builds on over ten years and 500 million hours of operation of the original SX. It’s far more powerful and productive than any other product of this class for managing servers, switches, security appliances, rack PDUs, virtual hosts, and wireless / telecom equipment. Powerful hardware at 1GHz CPU, 512 MB RAM, 8 GB Flash memory. Serial processing at 10 connections per port and up to 200 simultaneous sessions. Auto-sensing DTE/DCE ports: no more rollover cables. Scales to thousands of devices with Raritan's CommandCenter. Besides the high performance serial processing from a more powerful hardware platform, there’s a NEW Java-free web browser option for remote access and management. Remote power management is essential for many IT and communication applications. Watch this video to learn how the PX series of intelligent PDUs can help you to meet those challenges head-on. Reliable power distribution for single or three-phase power at 120 to 400V. Metering at the unit, outlet, and PDU branch circuit level. Easy mass deployment and lifecycle management capabilities. There's also an entire line of power distribution products like rack transfer switches that improve reliability in single power supply devices. Plus, environmental monitoring solutions that improve the overall reliability of your infrastructure. Trade-in old KVM Switches or Serial Console Servers from Raritan or any manufacturer. Save BIG on next generation solutions. Speak to us to see if you qualify for an onsite evaluation unit. If you qualify, there's no cost and no commitment necessary. Who Uses Our TAA Compliant Government Solutions? Our solutions are available on a number of State and Federal Government Wide Acquisition Contracts (GWACs). Qualify for an onsite eval unit.